Dr. Mark Hyman is the author of the book Ultrametabolism: The Simple Plan for Automatic Weight Loss, developed from the concept of nutrigenomics – the science of how food is ‘information’ that communicates with our genes. Learn to work with, instead of against, your body, and use the natural fat burners within. Eating the right foods communicates weight loss and health; eating the wrong foods communicates weight gain and disease. 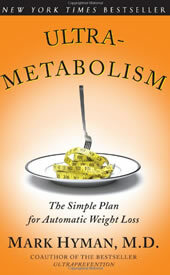 Ultrametabolism explains how to prevent disease, prolong life and make dieting obsolete, with no calorie counting, no talk of ‘carbs’ or other fads, based on science tailored to an easy-to-follow, customizable program for automatic weight loss and good health, regardless of your age. Phase I for three weeks of detoxification – introduction of whole ‘healing’ foods and elimination of common food allergens like dairy products, eggs and gluten. Phase II from week 4 for life – reprogrammed bodies and genes to lose weight permanently, including planned reintroduction of previously banned foods to monitor their effects on your health. Dr. Hyman states that weight-loss will amount to 11 to 21 pounds or more, by the end of eight weeks. Here is a sample of the many recipes included in UltraMetabolism, which also contains daily menus, shopping lists and more, for the two major phases in the UltraMetabolism plan. Preheat the oven to 400 degrees. Bake the potatoes until soft, about 45 minutes. Combine the paprika, oregano, thyme, cayenne, and salt in a small bowl. Place the halibut on a plate and sprinkle with the seasoning to coat the fish well. Heat 2 teaspoons of the olive oil in a skillet; add the peppers and mustard greens, and sauté on medium heat for 5 to 7 minutes. Add the remaining teaspoon of olive oil and the halibut. Sauté over medium heat for 3 to 4 minutes on each side until browned and cooked through. Serve the fish and vegetables with a baked sweet potato. Other healthy recipes can be found here. I read UltraMetabolism when it was first published, and I found this book to be enlightening and gave me some things to think about. Making some simple lifestyle changes can go a long way in improving your quality of life, not just in losing weight (although I did lose 55 lbs and have been at my healthy target weight for the last three years). I recommend it to anyone that seeks a healthier attitude about food that will lead to better health overall and that can break the cycle of weight loss and weight gain. As for the recipes in the back of the book, I skimmed them to get an idea of what kinds of meals Dr. Hyman suggests, then I tailored my own recipes to more closely resemble the nutritive content and ratios of those meals. I’ve been successful in creating quick, nutritious, and tasty meals by using the suggested recipes as an example, not by trying to follow them to the letter. Some people have the time to spend an hour or more preparing a meal, but most do not (I know I don’t), so try seeing the book as a well-laid set of suggestions rather than dogma. I read Ultrametabolism. After years of trying to learn to improve my health through exercise and eating I was thrilled that the end of the book was going to give me a simple way to prepare food for a busy life style with a shopping list to boot. Then I got got there…Are you KIDDING ME! It has been a huge let down. People with busy lives in NYC don’t have time for this. The shopping is a little heavy, but can be done. The kitchen tools… agreed. What person with a heavy work load has time to prepare these meals weekly?